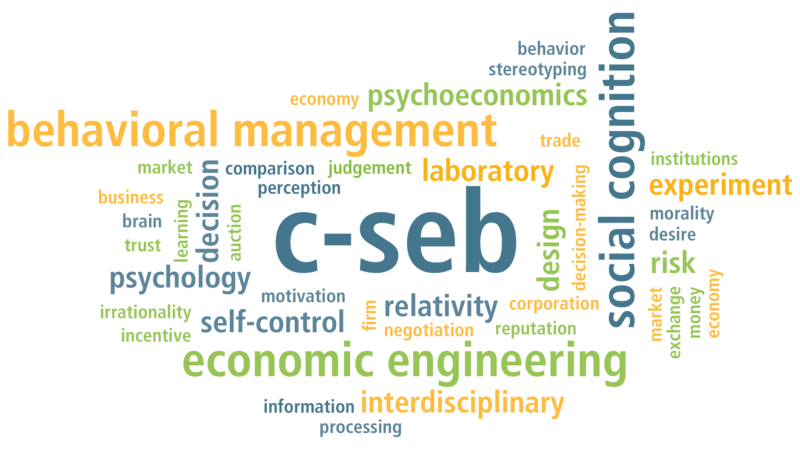 The research agenda of the Center for Social and Economic Behavior (C-SEB) covers three separate yet interconnected research areas: Behavioral Economic Engineering, Social and Economic Cognition and Behavioral Management Science. Each of these three fields focuses on a different aspect of human behavior and thus contributes to a comprehensive understanding of social action. Behavioral Economic Engineering is the science of designing real-world institutions based on sound behavioral research. Actively designed economic mechanisms play an important role in modern economic life; examples include auctions, energy markets, emissions trading rules, procurement and supply chain contracts, employee compensation plans and online markets. Research on Economic Engineering is important because the institutional designs chosen affect prices, public spending, satisfaction at work, the probability of acquiring scarce resources, the degree of (dis-)trust in markets and the success of politics. Social and economic cognition research aims at a better understanding of human thought, action and judgment in social situations by examining the underlying cognitive processes. The topics covered in this research field range from the questions of self-control to the effects of social comparisons and the dynamics of processing emotionally charged information. Research in this field is valuable because social cognition not only influences social interaction but also the way how economic decisions are made. Behavioral Management Science uses methods from microeconomics to study organizational structures and personnel decisions within and between firms. It integrates concepts from psychology, economics and operations management and utilizes economic modeling as well as laboratory experiments and field data. Understanding human behavior in organizations can help us in optimizing management decisions and organizational performance.